The FDA approved a new treatment for improving the vision of people who suffer vision loss from severe macular degeneration. End-stage macular degeneration is the advanced form of age-related macular degeneration with severe loss of central vision. With the implantable telescope you can improve your vision. The implantable telescope developed by CentraSight is implanted inside the eye after removing the lens of the eye or in most cases removing a cataract. What is an Implantable Telescope? The telescope is designed as a wide-angle microscope in a Galilean configuration that with the optics of the cornea providing a telescopic system inside the eye. The telescope is 3.6mm in diameter and 4.4mm in length. The telescope enlarges images 2.2 to 2.7 times their normal size depending on the model used. 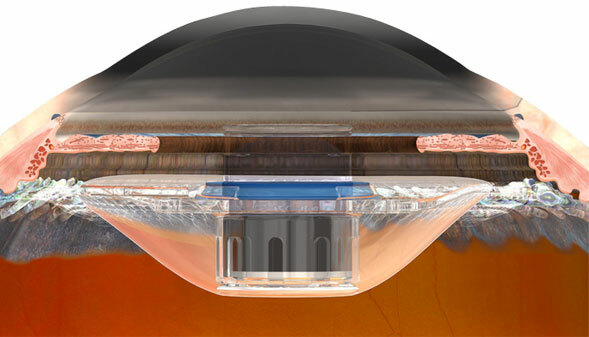 The implantable telescope is composed of three components consisting of a fused quartz glass capsule that contains the wide-angle microscope elements, a clear polymethylmethacrylate (common substance that intraocular lenses are made of) carrier, and a blue polymethylmethacrylate light restrictor. How Does the Implantable Telescope Work? The magnification of the telescope projects images onto healthy areas around the macular degeneration versus onto the scarred macula. This allows patients to have improved vision compared with conventional glasses. You have irreversible end-stage macular degeneration from either dry or wet macular degeneration. You are no longer a candidate for drug treatment for your macular degeneration. You have not had cataract surgery in the eye that the implantable telescope will be inserted. You meet age, vision, and cornea health requirements. Once it has been confirmed that you are a potential candidate, your vision will be tested with an external telescope stimulator. The results of the test and the training/rehabilitation evaluation visits will provide the information that you and your eye surgeon will need in order to make the final decision on the surgery. The first is the diagnosis that you have end-stage macular degeneration in both eyes and meet the vision and ocular requirements for surgery. Testing with the external telescopic stimulators is done. Low vision specialists will go over the vision training and rehabilitation. After the surgery, specially trained eye doctors and/or occupational therapists will work with you on helping you learn how to use your new vision. The CentraSight Implantable Telescopic Treatment Program helps to restore vision in people who are blind from end-stage macular degeneration in both eyes. The potential benefits of the telescopic lens are improved vision and the ability to better perform daily tasks. This lens does not directly treat the macular degeneration but helps restore some of the lost vision.